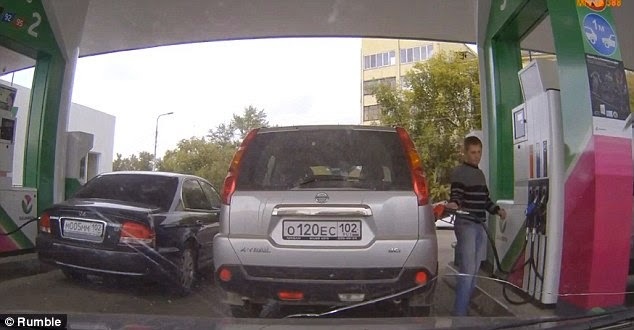 A woman driver in Russia wrongly believes she is the victim of a prank when she fills up the wrong vehicle. The motorist mistakenly tries to fill up the wrong vehicle and she is convinced that someone is playing tricks on her until the real owner of the jeep shows up and informs her of the mishap. 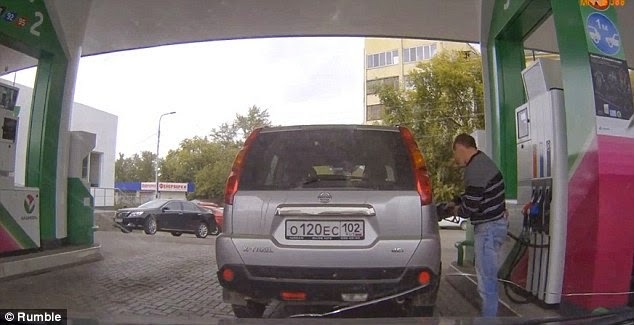 The amusing incident was caught on cameras as the man fills up his vehicle and he leaves the fuel nozzle in his jeep and walks into the petrol station. Moments later, a woman appears and inserts a different nozzle and leaves it in the jeep while she walks away. The man returns and replaces the petrol pump the woman placed in the vehicle with his preferred fuel. The passengers in the car behind the vehicle film the incident and they laugh uncontrollably at the comedic confusion. 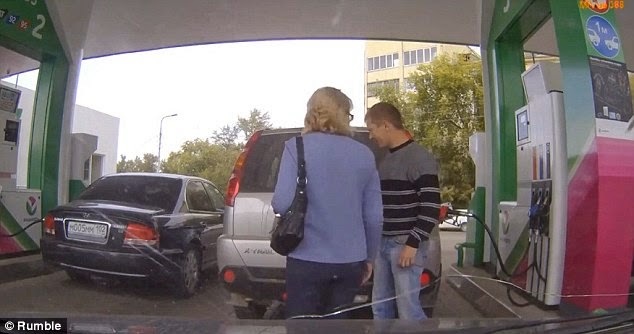 The woman is visibly perplexed and somewhat annoyed when she returns to the vehicle a second time and she notices a different petrol pump nozzle in the jeep than the one she inserted. She turns around and looks at the passengers in the car directly behind the jeep, who are laughing hysterically, and gives them a dirty look much to their amusement. The woman is seemingly convinced that they have played a prank on her. After one minute and 47 seconds clarity is finally restored while the woman is standing at the vehicle when the real owner returns once again. The man seems to ask her what she is doing putting fuel into his jeep and then he points to his registration plate to provide further evidence that she has been filling up the wrong vehicle. The woman looks mildly startled as she realises her mistake and walks away in an embarrassed manner. The man shakes his head dismissively and then smiles over at the two people recording the footage who by now are laughing uncontrollably.